The Excursionist as Mr. Hall Would Have Him -- Thank You, Mr. Hall! 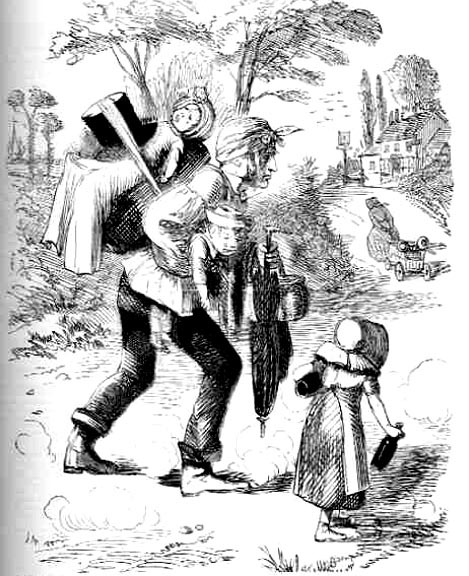 "Mr. Hall, Chief Magistrate at Bow Street, cannot discover any 'inconvenience' in the present working of the Act, but recommends that the poor Sunday excursionist should 'Strap a Knapsack on his Back, with Two or Three Bottles of Beer, and the Child to boot, sooner than the Sunday should be desecrated by Opening the Public-House'." Punch's depiction of the plight of the respectable working classes is the magazine's response to "Lord Grosvenor's Revenge," a parliamentary bill intended to prohibit the sale of beer on Sundays.